With over 30 years experience, our covers can be seen on the pianos at Hollywood's Academy of Motion Picture Arts & Sciences, the Smithsonian Institute & even on the TV show Desperate Housewives. Black Or Brown Standard Mackintosh- Prices are as listed. 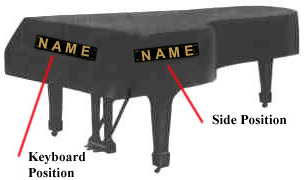 Important: Please type in the Name & Size of your Piano in the space provided below. Miscellaneous Sizes - If your cover size is not listed, select the next size up, or put your measurements in the drop down box below and the price will be the same as the appropriate size listed. Select your cover from the drop down menus. I have a 7' 10" Knabe that was part of the Metropolitan Opera series, circa 1926, fully resstored. I was a bit nervous about having a custom cover made. We used an old sheet to create a template, carefully traced and cut it to the size of the piano and mailed iit off per the instructions. In about one week our cover came, perfectly fitted, the material is great and it looks great. I'm extremely happy with the piano cover I ordered. I am a teacher and I got it for the piano in my classroom. The padding is heavy duty enough that I won't worry about the piano getting damaged, and the whole thing is light weight enough that it is a breeze to take off and put back on the piano. And it was shipped and arrived quickly to my front door. Thanks! The website was easy to navigate, offering an exact fit for our school piano. The measuring illustrations were helpful. It fits perfectly and looks like it will last as long as the brand new grand piano! I will order again if I need another one. 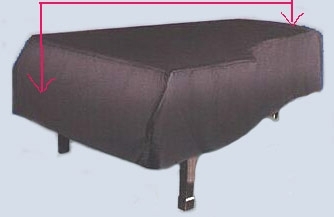 We ordered a padded brown Macintosh piano cover for our newly donated church piano. The fabrics inside and out are durable and high quality. The design and construction are top notch. The cover fit well and will protect our new instrument for many years. Thank you.